Launch Order Launching out of Shad Landing, Boats in the water by 6. Oct 28th & 29th – SQT – Sassafras – Results Click on the tabs at the bottom to see the full results of each day. You can fish with a partner or by yourself, its a fun and relaxing day of bass fishing. No Points, No Pressure, No Worries, Show Up and Fish! 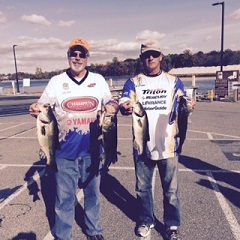 Jay Walls and Greg Alexander showing their impressive 19.69 lb winning bag at the first Bill Hubbard Open of 2015! 2014 Tournament results, draws and info!! We will be posting a link to all the 2014 action right here!! Click the links below for all the needed information for the tournaments. I want to thank everyone that came out and fished the SQT and a special thanks to those that helped out during the weigh in. Shelton Walters, Jim Fields, and Mark Hogan, your help made running this event very smooth!! I also want to thank my Fiance for coming down each day and getting the holding tanks full of water, the weigh in area set up and getting the weigh in slips completed. Without you this, tournament would not have been able to have run so smooth. Congrats to the anglers that made the 2013 team. The full field results are attached. The Day 1 Lunker went to Ronnie Littleton who weighed in a 5.53 lunker. 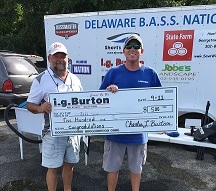 Day 2 Lunker went to Bob Austin who weighed in a 7.41 lunker. We will be posting a link to all the 2015 action right here!! Click the links below for all the needed information for the tournaments. A.O.Y. Standings 24 Boats Have Qualified for the Classic on October 3rd. 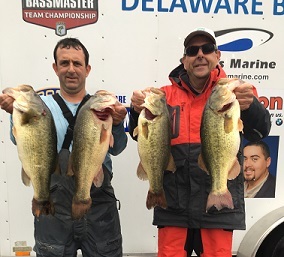 Greg Alexander and Jay Walls win the 2015 DBN Classic. The Classic is scheduled for the 14th of November. Donuts and Coffee will be provided while they last! 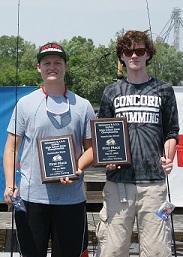 Congradulations Jackson Staib / George Carr of Concord High School!